An exciting new addition to the ICEM2019 format will be a networking and presentation reception event called ‘WattMeet’. For full ICEM delegates, this event will take place as part of the complimentary ‘welcome reception’ on Monday 24th June 2019. To find out about why you should attend and think about contributing as a presenter (using the proposal form at the bottom of this page), explore the FAQ below. 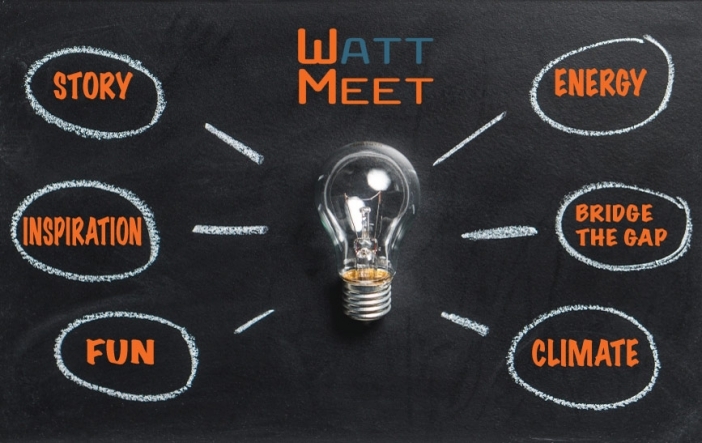 The name ‘WattMeet’ comes from a combination of the terms ‘Watt’ (to represent the nexus of climate and energy, as it is the unit of measurement common to both), and ‘Meet’ (to signify the gathering of like-minded people to share ideas). The core theme of ICEM 2019 will be ‘Exploiting the latest weather and climate technology to tackle the energy transition‘. In ‘WattMeet’, we invite conference delegates, faculty and students from DTU and other academic establishments, and interested members of the public to hear the ‘human stories’ and innovations behind the work that goes on in the climate and energy sectors. How does 'WattMeet' work? What is the format? After a brief introduction, ‘WattMeet’ will consist of up to ten ‘micro-presentations’ presented by pre-selected speakers. They will be delivered in a random order in rapid succession and will each last no-more than 5 minutes long. At any time during the event, attendees are encouraged to courteously network and discuss the presentations they are watching. Presenters are encouraged to make themselves available for informal chats over refreshments. Time will be given after the last presentation for all attendees to mingle, socialise and discuss. In total, the event usually lasts no more than an hour and a half, but are known to go on a little longer due to the enjoyment and energy that the event generates. 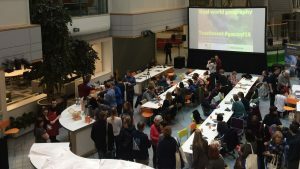 What talks and presentations will be given at 'WattMeet'? What is the criteria for proposing one? Perhaps you or your team went to extra-ordinary lengths to conduct a piece of research or develop a piece of technology? Did someone or something inspire you to take the career path or line of research that you undertook? Would you like to celebrate an unsung hero or two by giving some public recognition for their efforts? Is the work you and your colleagues are undertaking have a ‘wow’ factor that you would like to share? Do you have a success (or failure) story to tell which help others with their endeavours in the climate & energy sectors? Do you have some unique insight to share, which may help colleagues to think a little bit ‘outside the box’? Are you a musician or creative writer in your spare time, and would like to tell us about you work as a song or a lyric? If would like to participate in ‘WattMeet’ as a presenter, please submit your proposal below using the web-form. How did WEMC come up with the concept of 'WattMeet'? The concept of ‘TeachMeet’ is protected by Creative Commons Attribution-NonCommercial-ShareAlike 3.0 Unported (CC BY-NC-SA 3.0). This means that ‘WattMeet’ or any similar derivative should also be protected as such. Anyone is free to run their own ‘WattMeet’, ‘TeachMeet’ or similar versions so long as the conditions set in CC BY-NC-SA 3.0 are met. When will 'WattMeet' take place? Is it for ICEM2019 delegates only? ‘WattMeet’ is scheduled 6:30pm-8:00pm (Copenhagen time), Monday 24th June at DTU Lyngby. Exact venue TBC. ‘WattMeet’ is open to anyone with an interest and background in the fields of meteorology and energy. While full ICEM2019 delegates are invited as part of their registration package, we welcome anyone who is interested including members of the public, staff and students from the region’s academic establishments, and those employed directly or indirectly in the climate and energy sectors. Indeed this is a fantastic opportunity for a wonderful mix of people from different backgrounds to interact and hear each other’s stories. Is there a cost to attend 'WattMeet'? ICEM2019 delegates have complimentary entry to ‘WattMeet’ as part of their registration package. It is our ambition to also allow non-ICEM-delegates to attend the event for free. We are seeking sponsorship for ‘WattMeet’ to help us with this. There is no fee to submit a proposal to give a presentation for either ICEM2019 delegates or non-delegates. We are still yet to confirm refreshment plans. Whether this is through a paid-bar or offered with compliments, or whether food will be on offer, will depend on the number of attendees who register and sponsorship. This form is for completion by those wishing to participate as presenters. No more than 100 words. The 'WattMeet' is intended to provide a relaxed platform to showcase the 'human story' and innovation behind the important work of climate and energy science and industry. Presentations are only 5 minutes long, which best suit enthusiastic, visual and dynamic delivery. No more than 60 words.